In cooking, butterflying means to cut a thick piece of meat in a particular way so that it is then half its original thickness. The technique is to cut the meat down the center—without going all the way through—and then open the flaps as you would a book resting on its spine. Certain cuts of meat, like chicken breasts and pork chops, can be butterflied. Butterflied pork chops cook quickly and are an excellent choice for grilling, stuffing, pan searing, and broiling. Butterflying the pork chop also means more meat surface, which is ideal if you will be marinating the meat before cooking. 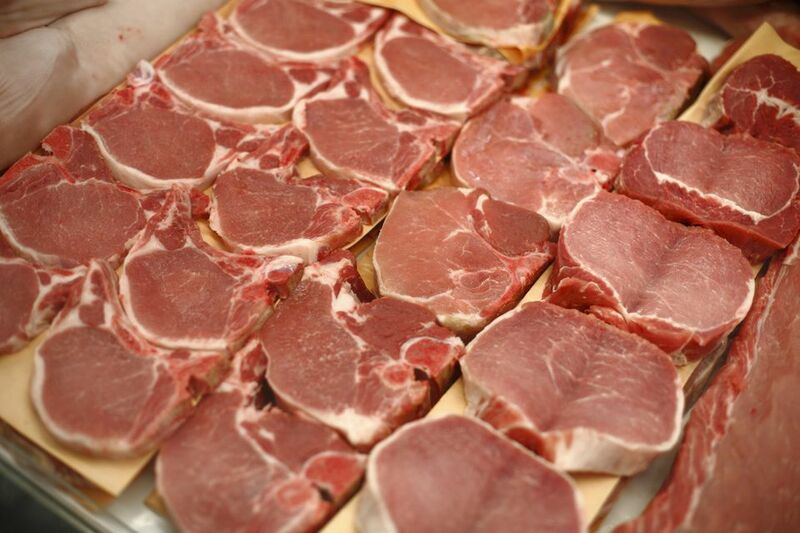 It is best to start with boneless pork chops that are at least 1 inch thick. Place one of the pork chops on a cutting board, fat-side up. Use a large, sharp knife to trim off any visible fat, if you'd like. In order to get an even thickness, you need to cut as close to the middle as you can. Determine the approximate center of the chop. Center the knife on the pork chop and begin the cut. Now you are ready to make the cut. Carefully slice down through the chop about half way. You want to be sure you don't cut all the way through! If you do, you'll end up with two thin chops. You want to make sure you keep the pork chop in one piece. Like you are opening a book, take each flap and spread it out, away from the center. Flatten the meat gently so it is even; you can simply press down with your hand to do this. Now, you should have a perfectly butterflied pork chop, ready to cook. You will quickly become a pro at butterflying pork chops and can choose from a variety of recipes featuring butterflied and stuffed pork chops. Braised butterflied pork chops boast a tangy sauce made of Dijon mustard, beef broth, lemon juice, and dill pickle. And butterflied pork chops work nicely in a recipe for chops wrapped around a pecan stuffing—even better, they are cooked in the crockpot. Swap a chop for the tenderloin in an apple stuffed pork recipe, which combines the flavors of sage, apple, bacon, and onion, or in pork with Madeira sauce, an easy dish highlighting the nutty, caramel-colored wine. You can also butterfly your boneless pork chops to speed up the cooking time in any recipe for pan-grilled pork chops, or instead of creating a pocket in a recipe for stuffed pork chops, butterfly and then roll up and secure.